I got to meet and network with some GREAT people and companies. Networking is very outside of my comfort zone (100% introvert here) but I am so happy to have these new connections. I published my second "Seven Days of Scarfie" collection...and it was a huge hit! Thanks to all of you who supported my patterns by clicking, commenting and sharing! I got many of my patterns up and available in formatted, printable, ad-free PDF form on Etsy and Ravelry (don't worry-they are still free on the blog!). In fact, until the new year they are all half off...making most of them just $1! Sign up for my free email newsletter to get all of my updates on free crochet patterns, monthly promo codes and more crochet news directly to your inbox! The Crunching Leaves Mod Scarf was my first time playing with the lovely Lion Brand Mandala yarn, and I was so happy with the results! I really love all the color combos available with Mandala, so even if these fall tones aren't what you want for winter you have plenty of other options for this modern triangle scarf. As I mentioned above, my "Seven Days of Scarfie" 2017 pattern collection was a huge hit! This Coffee Bean Infinity Scarf made the top 10 list this year and it is truly one of my favorites. The color gradient, the bean stitch...what's not to love?! 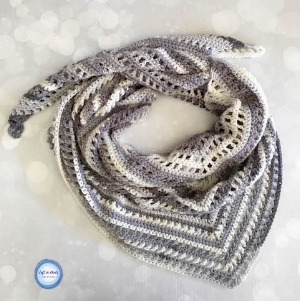 I have used the Celtic Weave Stitch in several patterns, but your favorite for this year was the "one skein" or rather one cake Lucky Celtic Infinity Scarf. This pattern uses one cake of Caron Cakes yarn and shows off the colors beautifully! I even have a (left handed) video tutorial to help you out with the Celtic weave stitch :) I'm going to be working on more left AND right handed video tutorials in the future! The Snowball Slouch Hat is another very popular pattern from my Seven Days of Scarfie 2017 collection! It is written in 4 sizes too, so you can go ahead and make matching hats for the whole family :) My daughter and I have been wearing these all month! The Wrap Me in Ice Cream Shawl was the first and only traditional shawl pattern I have on the blog right now, but I'm thinking I may write a few more in 2018! I loved using Lion Brand Ice Cream yarn for this pattern because it did all of that pretty striping work for me :) It's also a nice light weight shawl making it perfect for the changing seasons. The Mint-cicle Scarf was the MOST popular pattern from my Seven Days of Scarfie 2017 pattern collection. I have a sneaky suspicion it's because of that pretty double-knotted fringe and of course the beautiful Mint/Silver colorway <3 The best part about this scarf is that it is totally beginner-friendly while still looking modern and unique. Ok, ok....technically I designed these Crochet Water Balloons in 2016 (in fact they were one of my first patterns!). But they got REALLY popular this past summer and I did update the pattern and add a full video tutorial. So I figure that counts ;) If you haven't seen or tried these before and you have children in your life, I really urge you to check out the post! I have had so much positive feedback about these. I love that they are latex-free, reusable, washable and just plain a fun toy to play with. In fact the Crochet Crowd even wrote up a blog post about them which was a HUGE honor. If the Car Seat Cloak is one of my most used crocheted items, I think these would officially take the slot of my most used project! We used them most days in the summer time, and my daughter and I have even been using them indoors (dry) this winter for pretend snowball fights. Last winter when the new Caron Cakes colors came out, I had to try this beautiful colorway! The Strawberry Patch Convertible Scarf is warm enough to act as a scarf, but also light enough to be a modern, tasseled shawl. The popularity of this scarf also inspired me to create the Chroma Scarf in the same shape. I'm loving the tapered ends! The fact that a baby blanket was my #1 most popular free pattern this year bodes well for me. I am currently pregnant with baby #2 (our first boy!) and I know there will be a few more baby blanket patterns sneaking onto the blog in the near future ;) I can't decide if the random striping, the super soft yet bulky yarn, or the lovely texture of this Baby Bean Baby Blanket make it my favorite. Honestly I love everything about it! It is super easy to adjust in size as well and would make a beautiful throw or full-sized blanket at well. And there you have it! Did your favorites make the list this year? Thank you again for helping to make 2017 such a fabulous year for my blog! I have started seeing lots of photos of your work lately and I LOVE it! Come share more pictures of your work in my Left in Knots Crochet Community or use #leftinknots on Instagram. If you are looking for more of my free patterns from me, you can find all 100+ here!